You’re invited! Join us for a Nurse Residency Info Session and Interview Day on April 16 and April 17 at Rothchild’s Catering and Conference Center from 12-6 p.m. for graduating new grad RNs (juniors are welcome as well)! Our Nurse Residency Program Coordinator, Sara Borges, will be available to chat about our residency program along with recruiters and leaders from across our health system about new grad RN opportunities! Feel free to download the flyer below and share with your fellow classmates! 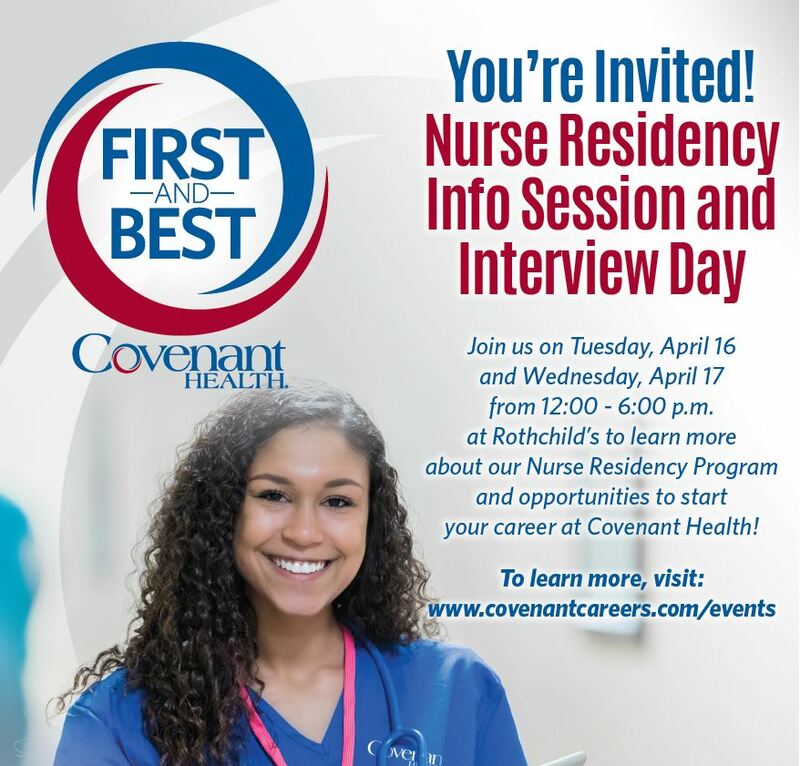 Covenant Health’s Nurse Residency Program (NRP) supports newly graduated registered nurses (RNs) to help them successfully transition from educational settings to a fast-paced hospital environment. The 12-month structured program uses classroom learning seminars, case studies, small group discussion, precepted clinical practice and evidence-based practice projects. In what unit or department are you interested?